New winter tires on the way! After a couple scary moments on the road and hearing some VERY scary tales on various bikey lists, I've decided to get some proper winter tires. 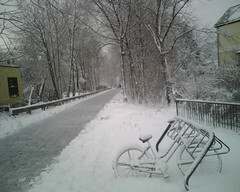 I based my decision on 3 sources: www.icebike.com, the Charles River Wheelmen list, and Peter White Cycles in New Hampshire, which seems to be the top source for winter biking stuff. Icebike and Peter White's website both have a lot of info about studded tires, and consensus seems to be that Finnish Nokian is the best. They do some very robust and quite spendy models that are designed for cross country riding in arctic conditions - clearly not what I need. I first wanted to go with the Winter version of the venerable Schwalbe Marathon, but White's shop was sold out. Instead, I ordered a pair of Nokian A10s. Like the Marathons, they're designed for commuting, with intermittent ice and snow. Of course, this will also be a good incentive for me to clean my drivetrain and rims when I do the switch! I'll post again once I've got them fitted and logged a few miles. The locks I leave near the office were frozen solid today (drat! ), so I locked up at a nearby office building. It's the HQ of one of Boston's most succesful companies. It's recently been refurbished resplendently. 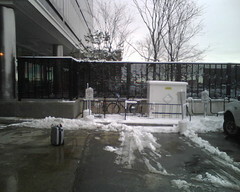 But despite the hundreds and hundreds of people who work there, bike parking has been relegated to a couple racks at the edge of the loading dock. But I did want to have a look at how the path looked after having been plowed. Here it is, just at Carberry's (now Java Somethingorother), and it looks pretty good! Just a fine dusting since it was plowed, but entirely rideable. As was, it turned out, the rest of my usual route to work. Just required a little extra caution. I managed to ride exactly zero miles during the holidays owing to bad weather (tons of snow - bad for biking, anyway) and persistent mild sickness. But now it's the new year, and after a bout of single digits last week, things have milded up and it's quite nice for biking! I got back in the saddle yesterday (Sunday) for a ride up to Carlisle. I just wanted to do a loop up around Great Brook Farm and back via Concord. Mission accomplished, but it was a tough one! The weather was nice, high 30s, and most of the snow was gone on the main roads, so riding was smooth. Surprisingly little traffic too, especially in the first couple hours before 10. Once I got to Carlisle and turned off the main road to head through the State Park, though, it was a different story. The woodsy farmy scenery was beautiful, but the road surface was atrocious! It started a little slushy (causing me to have two near falls, putting a foot down each time), but after not too long, the entire surface was covered with varying thicknesses of packed snow and ice. To add to the treacherousness, the road was narrow and pretty hilly. Fine on the way up, scary on the way down. I finally got the hang of it, sticking to the bits where the sand was embedded in the surface, and managed to stay upright. It was slow going, though! Fortunately, almost no traffic for that bit. I had another little hardship on the way home. As I left Concord, my energy was sapped. I wasn't going fast at all, but the lactic acid hit my thighs with a vengeance. I stopped and took out a rock-solid energy bar, which I muched on for a half hour or so. That helped for sure, but I never got back up to snuff; my ride up Park Ave to the water tower was just about the slowest I can remember - I usually even manage a better pace with the Christiania! Nevertheless, I got 35 miles under my belt, and I added another 20 with my commute today. Now that the Charles River Wheelmen has an online mileage tracking tool, I'll be logging my miles every month, and I'm off to a pretty good start!